Hakeem Olajuwon popularly known as “The Dream” is a Nigerian-born former professional basketball player who during his 18-year career, rose to become one of the greatest players in NBA history. Hakeem was born on January 21, 1963, in Lagos, Nigeria to parents Salaam and Abike Olajuwon as the third of six children. Raised by his middle-class parents who owned a cement business, Olajuwon played soccer and handball during his high school days at Muslim Teachers college, Lagos, Nigeria. Hakeem was only introduced to basketball at age 15, marking the birth of an American basketball legend. He soon joined the Nigerian National basketball team under coach Richard Mills, leading the team to win third place in the All-African tournament in 1979. In the year 1980, Olajuwon relocated to the United States and enrolled in the University of Houston, which offered him a scholarship to play for the basketball team (Houston Cougars) under coach, Guy Lewis. With a combination of size, strength, footwork, agility, and speed, the 7 ft 0-inch tall athlete quickly dominated the basketball game at Houston. There, he was nicknamed “The Dream” for his eye-opening skills, and effortless moves that ‘looked like a dream’. While majoring in physics education at Houston, Hakeem’s college career included playing three seasons and helping the Cougars get into the Final Four each year. Alongside Michael Jordan, Charles Barkley, and John Stockton, Olajuwon was drafted by the Houston Rockets as the first overall pick in the 1984 NBA draft. He teamed up with Ralph Sampson to become a formidable duo in Houston called ‘Twin Towers’ until Sampson left in 1988 and Olajuwon eventually became the Rockets’ undisputed leader as well as one of the best center players in the history of NBA. Hakeem was a marvel during his professional career. The 1993-94 season was the peak of his career as he became the first player to be named NBA MVP, NBA Defensive Player of the Year and NBA Finals MVP. Houston Rockets’ back-to-back NBA title wins in the 1994-95 season, earned him a place among the game’s best. He helped make the team the fifth NBA franchise ever to win back-to-back titles. Olajuwon received many accolades over the course of his 18-year long professional career. 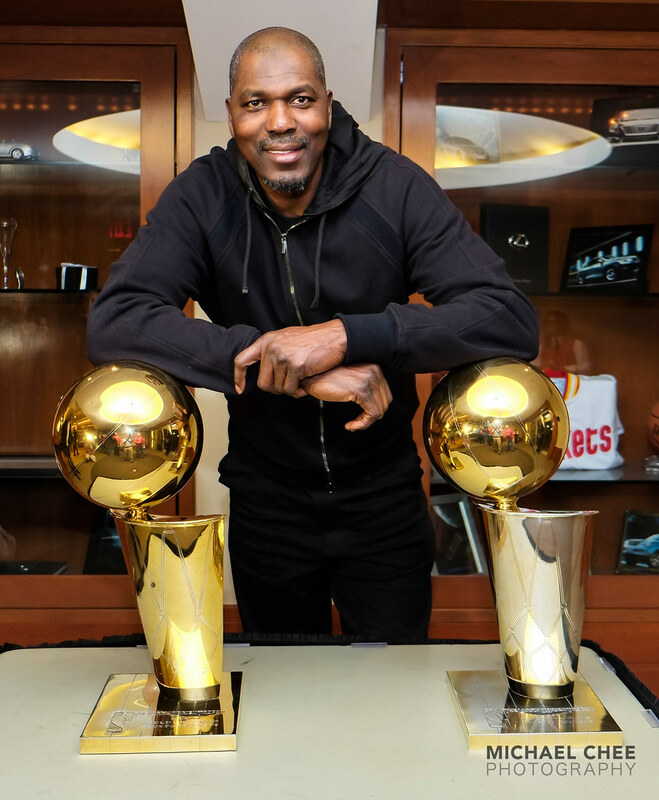 From winning a gold medal with the U.S. Men’s Olympic Basketball Team in 1996, two NBA titles during the 1990s, being named to the All-NBA First Team six times, and to the NBA All-Defensive First Team five times, as well as being named one of the 50 Greatest Players in NBA History, Olajuwon sure had an impressive career. According to his career records, he scored a total of 26,946 points, 13,747 rebounds, and 3,830 blocks. Hakeem spent seventeen years of his eighteen-year career playing for the Houston Rockets, and eventually joined the Toronto Raptors in 2001. He announced his retirement from professional basketball on December 2, 2002, after spending only one season with the Toronto Raptors. 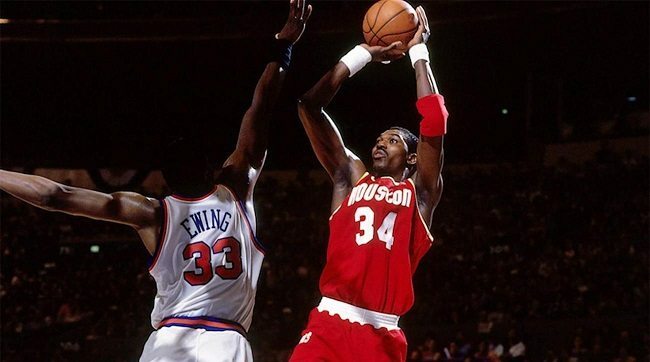 Considered one of NBA’s greatest center players ever, Hakeem Olajuwon was selected as one of the Greatest Players in the history of NBA and named to the Naismith Memorial Basketball Hall of Fame in 2008. He was also inducted into the FIBA Hall of Fame in 2016. After a successful NBA career, not only did Olajuwon become an instructor for NBA players, he also invested in real-estate becoming a successful dealer in Houston, Texas. From the real estate business, which he operates under his company Palladio Development Ltd, Olajuwon makes profits that exceed over $100 million. The star who was NBA’s international ambassador further made a few endorsements with sports companies which include Etonic, LA Gear, and a multi-year contract with Spalding Men’s Athletic Shoes. Given all his efforts, Hakeem Olajuwon earned over $100 million in salary during his professional career and has his net worth estimated at $200 million. In August 1996, Olajuwon married his wife Dalia Asafi in a prearranged marriage. A devout Muslim, Hakeem tied the knot with Dalia who was then 18 years old in a traditional ceremony. While the basketball icon has a daughter Abisola from a previous relationship, his union with Dalia has produced two more daughters Rahmah and Aisha. Just like her father, Abi is also a former basketball player and coach, who played for the WNBA’s Chicago Sky. After ending his professional career, Olajuwon who visited and trained in Jordan even while playing in the NBA settled with his whole family in the Islamic nation. Though it is quite common to find players who are oftentimes documented as an inch or two above their actual height, Hakeem Olajuwon really towers at 7 feet and weighs 255 lbs (115kg), a size which helped shape his legendary pro career.